When teaching about Jacksonian America, certainly one topic that comes to mind as critical is the market revolution. This short essay examines the visual evidence for the market revolution by examining family portraits, including folk portraiture, landscape paintings, and political cartoons. Professor Jaffee suggests ways to combine text and images in order to utilize images in teaching not as mere illustrations but rather as objects that constitute historical meaning. I want to offer some general ideas to start us off (and also show where I am coming from). 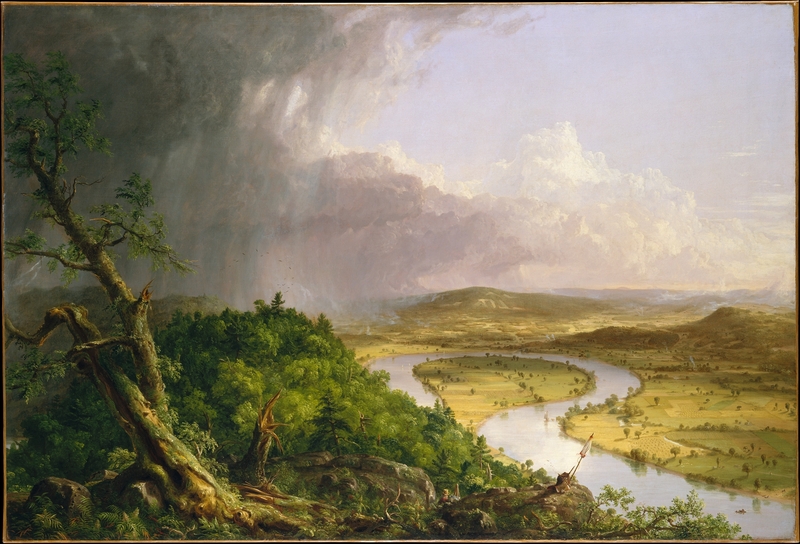 One of the premises of the Picturing US History project is to get us to think about how images might offer insights into our understanding of the Jacksonian era – not as mere illustrations but rather as objects that constitute historical meaning. This is a real challenge. We want students to be provoked and enthusiastic by looking at images in a history classroom, but also recognize that informed looking is not exactly the first skill that comes to mind for history teaching and learning – but that will change! I like what Lou Masur said in a piece in the 1998 Journal of American History in “Pictures Have Now Become a Necessity”: “Letting one’s students interrogate, speculate, and often hyperventilate is an alarming business, especially when at the [end of class] you cannot tell them definitely how to read a picture or precisely how an image shaped history.” The point of our classes is not to entertain our students, but to help them learn to think historically—to develop their facility for making historical meaning from the images, texts, and objects in the world around them. I have certainly changed my approach over time as I’ve come to realize more about my pedagogical goals and I hope our discussions will keep the teaching (broadly considered for classrooms and other settings such as museums) in mind. When teaching about Jacksonian America, certainly one topic that comes to mind as critical is the market revolution – the broad based integration of Americans into a commercial economy where they exchange labor and goods, a process that occurred in the decades after the War for Independence; indeed, Charles Sellers’ narrative of the era used that title while other important ones have been Sean Wilentz’ s The Rise of Democracy and Daniel Walker Howe’s What Hath God Wrought: The Transformation of America, 1815-1848. So where does the visual evidence fit in? Well, we can find images of the Erie Canal and I confess to doing a presentation on the changing views of Lowell that shows some pretty startling changes in the bucolic landscape and increased massing of brick factories in the background. Still, that leaves images mostly at the illustrative level of presenting visual evidence that reflects processes that we know primarily from textual data. We are all fascinated with images and we don’t want to lose the power of the visual. There are lots of ways to look at this topic – first, we might construct a visual history of the era based on what sorts of visual materials were produced and how they circulated; second would be to consider how that visual evidence shaped or constructed historical events and processes. I want to start out discussing portraits and maybe demonstrating a different approach to that iconic genre. 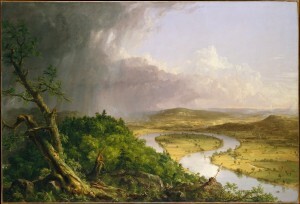 I confess to being struck many years ago when seeing some of the “folk” paintings created in New England in the 1820s and 1830s that were often seen as the work of isolated and self-taught rural residents who were seeking to remain isolated from the currents of economic and social change that promoted commercialization and a market orientation. In the 1920s and 30s the “folk art” collectors and others who were looking for “the art of the common man” as part of their effort to locate the roots of American culture came up with these ideas. 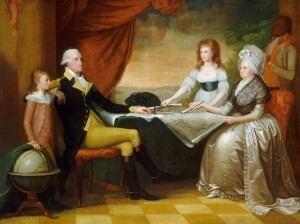 Still, these early scholars provided documentary evidence that showed something quite different — these painters were really provincial artists seeking to make a living by providing cheaper images to a provincial audience that was hungry for markers of status such as family portraits. So these “folk” portraits offer evidence for the democratization of portraiture, a trend related to the broad diffusion of refinement that Richard Bushman has so persuasively laid out in The Refinement of America. 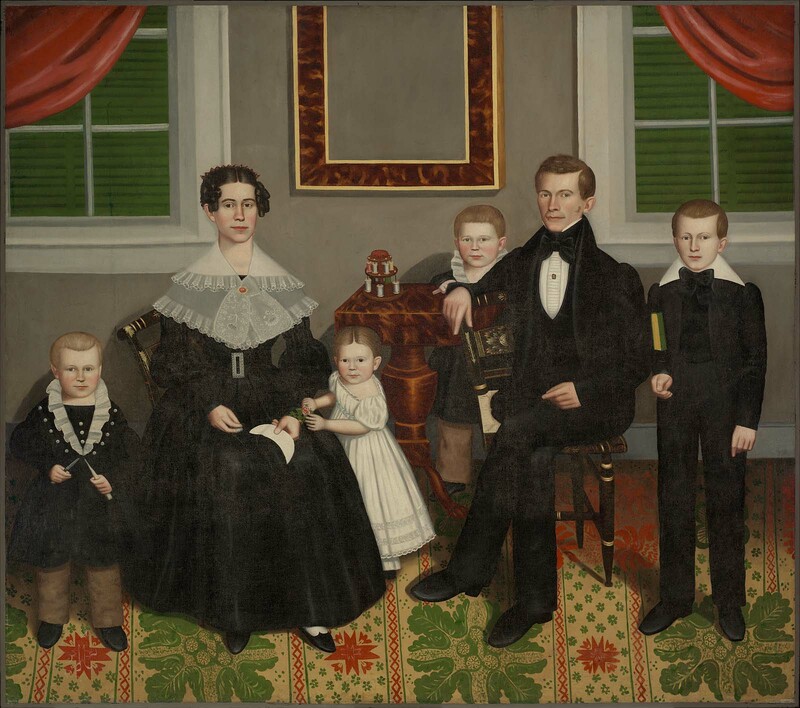 Let’s look at one prominent example that hangs in the Museum of Fine Arts, Boston: Joseph Moore and his Family from 1839 that was painted by that inveterate itinerant Erastus Salisbury Field. Then we want to be thinking about the décor that is so colorful here. Everything seems painted or “fancy.” What does that mode of decoration mean? What is the purpose of the prominence of that carpet? A related question is how does provincial portraiture differ from its more academic cousin? 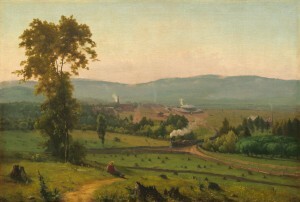 Field, by the way, did spend time in Samuel Morse’s studio in New York City before he went back to western Massachusetts to make his living. Some of these artists made furniture or painted wall murals (or even kept themselves afloat by painting just plain walls! ); I like to think about artisan-entrepreneurs as a way of pointing towards their linkage to artisans and craft production rather than genius and the romantic conception of the artist. So what emerges here from the artist side is how the emergence of this popular portraiture is a sign of the growing number of painters who combed the countryside to paint an increasing number of portraits, available in a far wider swath of the United States than ever before. But who were the sitters? Many of the sitters were prosperous farmers, merchants, and professionals, the beneficiaries of the market revolution, as Jack Larkin told us from his research for a 1992 Old Sturbridge Village exhibition that was published in Meet Your Neighbors: New England Portraits, Painters, and Society, 1790-1850, an unusual exhibition that focuses on the sitters and their social context. So we can interpret these portraits as a key instrument of middle class formation. Rather than consolidating an identity that was located elsewhere, these consumer goods are making claims for class identity in a particularly fluid period of social change. Moore was a hatter in the winter, a dentist in the summer, and a professor all year round – another itinerant who provided services across a changing countryside at a time when many communities couldn’t support a full time practitioner. 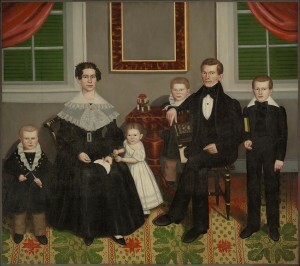 So by making Joseph Moore and his family visible, Field is part of their process of constructing a middling identity, part of their provincial world. I’m quite keen on using texts with our images, word and image, to contextualize those portraits. You can get a sense of how the artisan-entrepreneur shared the wonderment of portraiture, of how visual materials enter the household, in Chester Harding’s autobiographical account of his progress from backwoods jack of all trades to an academic artist ensconced in an urban studio: “One of the Primitive Sort”: Chester Harding Becomes an Artist in the Early 19th-Century Countryside. The Cole book also contains an excellent essay on the historical background by Sean Wilentz and Christine Stansell; they go through a variety of images but conclude with a series of political cartoons of the Jacksonian era, another prominent genre and one with politics at the center; and you can find lots at the Library of Congress Prints and Photograph Collection http://memory.loc.gov/pp/apphtml/appabt.html .